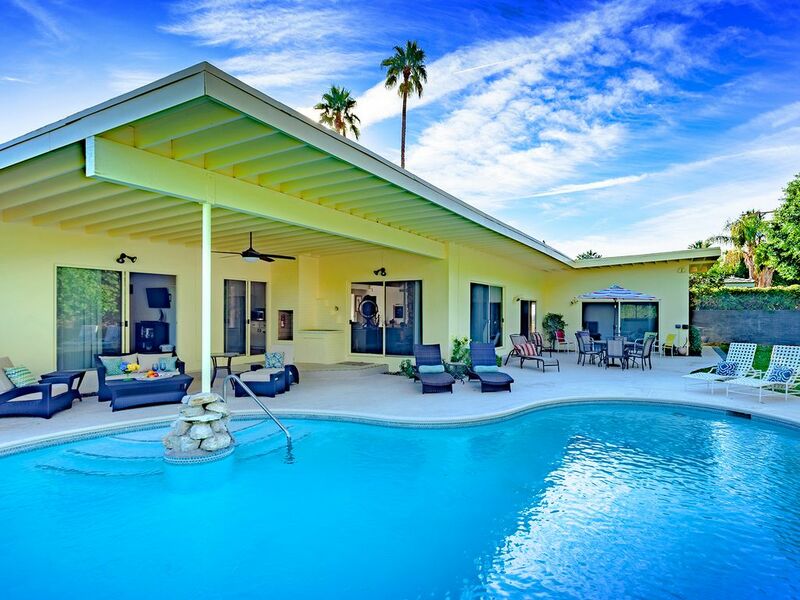 Retro Chic Palm Springs Vacation Home Rental where its all about relaxing in the sunshine. Very private yard. Huge sundrenched pool. Three bedrooms, each with its own bath and pool access! Guests rave about their stay at this iconic Mid-century modern pedigreed home located just a short stroll to restaurants, night clubs, and shopping in South Palm Springs. Access the very private yard from almost every room in the house. The pool area is enclosed by a luscious 20 foot ficus hedge and features a 30' kidney-shaped salt water pool with gorgeous mosaic tile, a shaded patio, a gas BBQ, and a large sunning area. Furnished for dining al fresco, nights under the stars and leisurely afternoons by the pool, this property is perfect for vacationing in true Palm Springs style. You may never want to leave the fabulous pool area! Step back in time and immerse yourself in entertainment history by vacationing in this centrally located, lovingly preserved mid-century gem, once the home of Julian Stiff, who ran and later owned the famed Palm Springs Chi Chi Lounge. His club’s Starlight Room was a veritable shrine to live entertainment of the Rat Pack Days. The brightest names in showbiz, from Frank Sinatra and Desi Arnaz to Duke Ellington and Lena Horne performed at the club - and the owner’s home, which became known as the Chi Chi House, served as the location for swank impromptu after hours parties and hair-of-the-dog Sunday afternoon barbecues. Still owned by the Stiff family, this architectural gem has been lovingly and authentically preserved. It’s easy to imagine Dean Martin and Sammy Davis Jr. lounging in the sunken living room, martinis in hand. You can almost hear Peggy Lee or Ella Fitzgerald belting out a tune while Buddy Greco tickled the ivories on the upright piano, which is still in its original location aside the flagstone fireplace. Stiff’s daughter, who still lives in Palm Springs, recalls everyone from Rudy Valle and Jane Russell to Johnny Mathis and Louis Armstrong helping themselves to coffee in the adorable pink and white kitchen. The Stiff family is proud to share the magical history of this fine example of Palm Springs mid-century style by offering it as a vacation rental exclusively for guests of Acme House Co. The fabulous home offers three bedroom suites (two king and one with twin beds that can be pushed together to form a king). Each suite has its own full bath, a television and direct access to the private pool. The master suite bathroom includes a step-down tub featuring an original cut-glass window from the famous Sardes Nightclub on Hollywood & Vine, which Julian Stiff also owned. I chose the Chi Chi house mainly for the pool and private outdoor space. Turned out to be perfect for me and my pup. The house lived really well for one person, but plenty of room for house guests. Not great if you need an office type of privacy. The house is very dated and could use some fixing up. The location is ideal, if you don&#x2019;t mind being on a very busy street. Convenient to everything and located in the very charming Deepwell district. I loved walking my dog through the neighborhood and looking at all the mid century modern homes and some very cool landscaping. I would consider renting this house again. We had a great time. The pool area is amazing. The house is definitely a retro experience. everything was great. Great Value - Cool Mid Mod House! Very special property that was perfect for our group of Mid Mod design and architecture fans. Loved being able to walk to great restaurants and night spots. Spent all our days by the huge kidney shaped pool. Yard was so private. Super great value. The place was clean, comfortable well maintained, and has a very hip 1950s Palm Springs vibe. Three couples vacationed in late July for a long weekend. I would love to give this house an excellent rating because it's perfect for a couples get away EXCEPT for the air conditioning. It was reading 88 degrees when we arrived and would not drop any lower so we called the rental agency. They sent someone out right away, checked out the system only to tell us that it was indeed working. We spent a lot of time in the pool and avoided using the oven or cooking anything that would warm the house further. Unfortunately things got worse when we woke up on our departure day to find that the AC system had shut down completely. Again the repair people came, changed fuses but it still was not working. We were stiflingly while trying to pack up to leave. Loved the ChiChi House but cannot recommend it during the heat. Great party house. Marvelous pool and location. Classic mid modern house, mostly original. RESERVATION DEPOSIT: $1000 due at the time of booking plus the booking fee and city taxes. The deposit is applied to your final balance which is due approximately 45 days prior to your arrival. The booking fee and tax is non refundable. Minimum age to rent in Palm Springs is 25, in Rancho Mirage the minimum age to rent is 30 Additional Fees: A nightly utility charge will be included in your "rent quote". This utility charge is applicable year round and included in your quote. Pool & Spa heating in season, (typically October through May). City of Palm Springs TOT tax: 11.5%, or City of Rancho Mirage TOT tax: 10% charged on the total rental rate, cleaning fees, damage waiver, utilities, and pet fees (if pet friendly Nonrefundable fee $150 for one dog, $225 for 2 dogs). No tax on stays over 28 nights.